This rectangular quartzose gneiss monolith, 2.3m in height, was once probably part of a stone circle. On the south-east corner (the righthand one in the photo), there is a complete and well preserved ogham inscription. It says "AVUO ANNUNAO UATE DOVENI" that can be translated in "Avuo Anunao, soothsayer of Dovenio". On the north-east face of the stone there is also a Pictish symbol, a double-disc connected by a cross-bar. 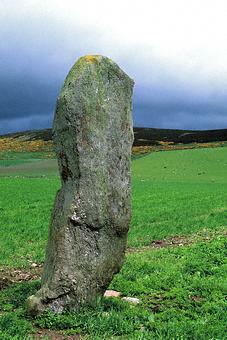 It is one of the oldest standing stones with ogham inscriptions in Scotland.